This software helps and simplifies the applicant tracking and interviewing activities. It manages from getting placement order from the compnay to placement of candidates. RMS, Recruitment Management Software is an advanced, flexible and functional web based corporate recruitment software which us capableof handling the complete recruitment process. It includes the entire functionalities of a job board and enables hiring managers to get involved in the candidate tracking processes. - Easy steps to create Job Opening. We are leading developers of Recruitment Software. Recruitment Software is a system that automates the whole recruitment process in an Organization – right from posting job openings on Job Portals and Social Media platforms to on-boarding of the new recruits. 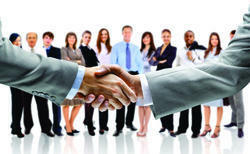 Recruitment is one of the most important tasks of any organization. Accuversa Recruitment Management is a better way to keep flying in the exciting area of staffing. It helps you manage recruitment cycle from the beginning till placement and more. In addition to the overview, an A4 print out, shares friendly reports of all your operations. A referral based end-to-end recruitment solution, ReferDesk will help manage your entire recruitment function, including employee referral, Agency Performance Monitoring, Interview scheduling, Status reporting and so on. Referdesk is available in SaaS model as well as on-premise model.